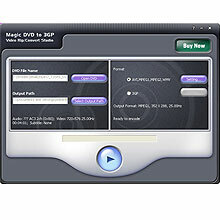 Magic DVD Rip Studio Pro backups your favorite DVD to VCD(MPEG1), SVCD(MPEG2), AVI, WMV, 3GP, MP4 format with ease! With the latest MPEG video encode technology, you are able to convert your DVD movies to MPEG video format file today without losing the quality and only need the 1/10 of original size disk space to save them. So easy to use and fast in speed that just a few clicks are enough to convert DVD to AVI/MPEG/3GP! It has a powerful converting engine and simple and easy-to-use interface to let newbie operate it without any difficulty; it support batch conversion and rip each chapter to an individual file, it also allow you to select subtitle & audio track and customize settings. Debut Pro Edition - Debut is a professional screen capture software. Record videos from your screen or take screenshots. With Debut you can capture your entire desktop or a selected portion. Save the image or recorded video as avi, flv, wmv and other video file formats. iDealshare VideoGo for Mac - Best Mac Video Converter for Apple Prores, AVCHD, MXF, AVI, WMV, MKV, MP4, MOV, OGV, WebM, M4V, FLV, MPEG, MOD, TOD, R3D, QT, 3GP, VOB, DV, on any Mac OS X; download Video in one click, edit movie files like trim, crop, merge, rotate and etc. iDealshare VideoGo - Professional video converter yet easy-to-use! It helps to convert all kinds of video and audio formats with almost no loss of quality. Also features video downloading or editing functions. VIDEOzilla - Videozilla is a complete video conversion tool for video files AVI, MPEG, RM, MOV, ASF, WMV, SWF, FLV, F4V, MPEG-4 (iPhone/iPad/MP4/IPOD/Mobile/PSP/Tablet), 3GP, 3G2, M4V, MKV, VOB, DAT, WEBM, OGM, OGV, Blu-ray, MTS, M2T, M2TS, TS, HD-Video. Tipard TS Converter for Mac - Tipard TS Converter for Mac has the ability to converting TS to many popular video formats on Mac, like AVI, WMV, MPEG, MOV, etc. And it also has the function of converting popular video formats to TS. Accessory Media Editor - You can play multimedia files (WMA,WMV,MP3,MP4,WAV,MID,MPG,AVI,FLV) using Accessory Media Editor. Select multiple files to play, or one file. Music or Videos playing, can be saved as Favorites. A history log is kept for all files played. Tipard DVD Ripper for Mac - Tipard DVD Ripper for Mac can rip DVD to video formats like MP4, AVI, MOV, WMV, MKV, M4V, etc. and audio formats like MP3, FLAC, WAV, WMA, AAC, etc. Thus, you can enjoy them on iPhone SE/6s/6s Plus, iPhone 6/6 Plus, iPad pro, iPad mini 4/3/2, etc. M4VGear DRM Media Converter - M4VGear DRM Media Converter can easily remove DRM protection from both purchased and rented iTunes videos while keeping 5.1 audio on Mac and convert M4V to unprotected video & audio formats with 20X faster speed and lossless quality.